Property Size 2,144 sq. ft. The Ridge #34 is a vacation condo in a small community of 2 and 3 bedroom condominiums that offer skiers luxury accommodations and relaxation at its finest in a ski in ski out setting. Ski all day, play all night, or simply relax by your wood burning fireplace or in your in-home Jacuzzi. Located on Faraway Road in Snowmass Village, directly on the Village Shuttle line, The Ridge community is an exceptional location only 10 minutes from Aspen. There is beautiful mountain scenery and plenty of extra fun activities every season of the year including hiking, biking, golf, rafting, horseback riding, dining and shopping. Enjoy. 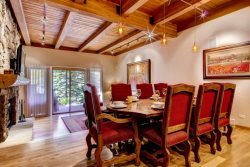 Step outside, walk a short distance to a private ski trail and ski directly to the ski lifts that take you up to the incredible trails and groomed ski runs on Snowmass Mountain. Your ski in ski out is about 400 yards away which means you are always close to your vacation condo. This is a spacious three bedroom condo near the base of Assay lift (ski in ski out) with spectacular views of Snowmass and Mt. Daly. Warmly decorated with many amenities like sauna, steam bath, Jacuzzi, entertainment center, TV’s in all rooms, wireless Internet and a massive lichenrock fireplace. Comfortably sleeps eight. Second floor master bedroom with king & single futon balcony offering spectacular views of Snowmass Mountain and a master bath with Jacuzzi. Sauna comfortably seats four adults. First floor bedroom with queen and private bath. All bedrooms with cable flat screen TVs and humidifiers. Full kitchen and large dining room table with seating for eight. Living room features large lichenrock fireplace, expansive sliding glass doors opening on to large deck with magnificent views of Snowmass mountain, large flat screen TV and full stereo system. Condo community contains two hot tubs, heated swimming pool, fitness room and heated ski storage area. Sauna comfortably seats four adults. Key will be under the front door mat.